Aviom's A360 Personal Mixer delivers a new level of control, performance, and fidelity to personal mixing on stage and in the studio. With more mix channels, innovative new features, and the streamlined user interface Aviom Personal Mixers are known for, the A360 will help you hear better than ever before. The A360 is powered by an advanced 36-channel mix engine, giving you more channels to mix. The mix engine supports 16 standard stereo or mono mix channels, the stereo or mono Dual Profile Channel™, and stereo or mono ambience. All channels can be individually selected for each A360 from up to 64 channels in the system. Each mix channel on the A360 can be either stereo or mono—which means you don't have to give up the fidelity of your stereo keyboards, guitar effects, or submixes in order to save channel space on your Personal Mixer. Every audio source can be heard in full stereo fidelity without taking up additional space on the mixer. This both ensures that every channel sounds its best, improving the fidelity of the overall mix as well, and frees up space for more mix content—without adding more complexity for the musician. The A360 gives you more control over the stereo image of the entire mix with the new Stereo Placement™ controls. With high-resolution panning for mono channels and the innovative Pan-Spread control for stereo channels, every channel can be positioned precisely in the stereo field of the mix, without losing any fidelity of individual channels. In addition to Stereo Placement, the A360 gives you control over each channel's volume, as well as tone and reverb. More control over each channel lets you get a better sounding mix fast. The innovative Dual Profile Channel™ may be used as a seventeenth stereo or mono mix channel or as a mirror of one of the 16 standard mix channels. Either way, the Dual Profile Channel stores two sets of channel settings for the assigned channel (A and B), allowing you to quickly change the volume, stereo placement, reverb, and tone of a selected channel without affecting the rest of the mix. The A360 allows you to bring ambience in when you want it and to quickly get rid of it when you don't. Because the A360 has a dedicated section for ambience audio in the 36-channel mix engine, you can add ambience to the mix—using either the onboard ambience mic or setting up room mics and sending the channels over the Cat-5 cable—without sacrificing other channels. Each A360 in a system can draw its channels from all the channels in the system—up to 64 channels can be available. Giving the drummer lots of drum channels and the singers all their vocal mics has never been easier. With the A360, every musician can control exactly the channels they need, giving everyone more control without more complexity. The A360 gives you 16 standard presets, plus four Instant Mix Recalls™, giving each musician plenty of space—and streamlined access—to his or her favorite mixes. Three-band master tone controls allow you to tune the output of the A360 to your exact preferences without a lot of hassle. The Enhance™ control was specially designed to help musicians get the most out of their in-ear monitors and headphones, delivering more punch in the bass and more sizzle to the highs, simply and quickly, without needing to understand EQ or spend lots of time tweaking. In addition to 1/4" and 1/8" stereo output for headphones and in-ears, the A360 adds an XLR Mono Mix Out with dedicated volume control. This added connector streamlines connections to a powered wedge or subwoofer, including Bass Shakers and Buttkickers. 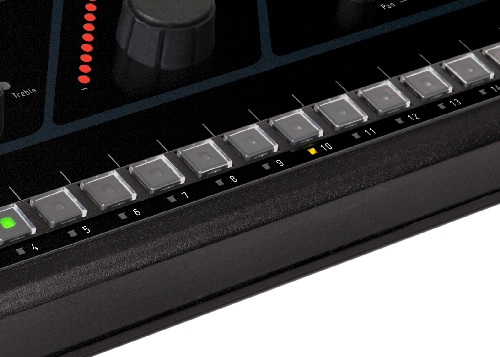 A rear-panel USB jack allows you to take all of your mixer settings with you, for safekeeping or for loading onto a different mixer.